The magnificent new Choctaw Casino Resort hotel features three hundred-thirty well-appointed rooms and luxury suites, Conference Center, Spa and RV Park. A Choctaw Casino Resort is located in Durant Oklahoma, only minutes from the shores of Lake Texoma. 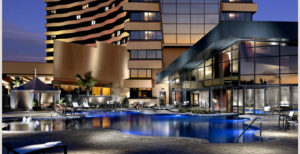 Choctaw Casino and Resort offers poker, slots and Blackjack in a truly upscale style. Choctaw CenterStage and Diamondback Lounge provide world class entertainment on the shores of Lake Texoma. The Event Center is often utilized for local events, Choctaw Nation Celebrations as well as the stage for well-known recording artist and comedians. Numerous restaurants are onsite offering everything from deli sandwiches to steak. Gilley’s, located in the North Casino, features a distinctly Southern atmosphere with just the right amount of flavor, entertainment and Country Western traditions. Two-step across the dance floor, take a spin on the mechanical bull, listen to live music and grab a beverage at one of the two full-service bars. The Gateway, located between the North and South casinos, offers live entertainment (often local bands) on Friday and Saturday nights.